Looking for unique places to stay? For somewhere unique to escape and get away from it all? Beds on Board have put together a collection of our most unique places to stay in the UK. We’ll give you an affordable way to find unique accommodation in a beautiful location. From a romantic lochside retreat in Scotland to a sunny seaside escape in the South of England or a celebratory city break in London, Beds on Board have a selection of unique stays for an unforgettable trip away. With options including converted trawlers, luxury motorboats and sumptuous superyachts you’ll soon discover that staying in traditional hotels, B&B’s and self catering accommodation just isn’t exciting enough. Take a look at our guide to find a special place to stay that won’t break the bank. Situated on a private wharf in a quiet neighbourhood in east London (Zone 1). Gainsborough Wharf is on a stretch of the Regent’s Canal running through a vibrant, yet tranquil area of Hackney called De Beauvoir. In the immediate vicinity you’re spoiled for choice. You’ll find London pubs, hip cafés, delis, markets, independent shops and some of the best eating places in London. It’s all on your doorstep and of course central London is just a few stops away on the tube. Book a truly unique experience afloat. Stay on this 55ft, wide beam canalboat, in your own urban oasis in the heart of East London from just £82.50 per person (based on 2 guests). Fort William is the outdoor capital of the UK with great views looking on to Ben Nevis. The Jacobite steam train is only a 10 minute drive from the marina. This magnificent vessel gives you the opportunity to experience the great outdoors. Whether it’s climbing Ben Nevis or walking up the path on the south side. Whether you are into mountain biking, walking (The Great Glen Way passes 20 meters from the boat), fishing or just enjoying the great outdoors, this is the location. Following her conversion and extensive refit, stay on this authentic deep sea fishing vessel from £42.50 per person based on 4 guests. This is definitely one of the most quirky and unique places to stay in the UK! This luxury 52ft Sunseeker motorboat is moored in the beautiful location of Europe’s largest natural harbour, Poole Harbour. Boasting some of Britain’s best beaches, one of Britain’s most exclusive places to buy a house and England’s first Natural world heritage site this boat offers the perfect base to explore. There are also plenty of lively bars and superb restaurants close by making this one of the most unique places to stay in the South of the UK. Stay on this boat for just £25 per person based on 8 guests staying on board! Lymington is set in the New Forest so offers great access to the water and the Forest. The boat is located in Lymington Yacht Haven, a 5 Gold Anchor site with great facilities. The marina includes a bar and restaurant, shops, new toilets and showers and car and bike hire. This fabulous location provides easy access to lots of good pubs, restaurants, shops and even a few SPA’s in the New Forest Area. This 65 ft classically styled motorboat is immaculate and spacious. She is maintained in first class condition, no expense has been spared to keep her “as new” for accommodation for up to 5 guests. Stay on this boat for £79 per person (based on 5 guests). Steeped in history and beautiful scenery, its impossible to imagine anything that isn’t special about Bath. During your stay on this boat in Bath you will be able to enjoy; The Roman Baths and Pump Room, The Thermae Bath Spa. For some culture don’t miss The Theatre Royal, The Jane Austen Centre, Bath Abbey, The Herschel Museum of Astronomy. There’s also the very entertaining Bizarre Bath Comedy walk. Longleat Safari and Adventure Park and Wookey Hole Caves are only 35 minutes away. As a luxurious widebeam boat you will find a level of decor, spaciousness and comfort more associated with a floating cottage at a price from just £47 per person based on 4 guests. A vibrant, cosmopolitan cocktail of boating enthusiasts, bars, restaurants, entertainment (including bowling, cinema and casino) and chic shops best sums up this marina. Brighton is the UK’s largest marina and offers views out to the English Channel. And just10 minutes from Brighton sea front and centre, provides the perfect base to explore. On board you will find all the luxurious refinements synonymous with the awesome Sunseeker Predator 82 Motor Yacht. Spacious cabins and public areas make this a special place to stay for families and couples alike. Stay on this boat from £62.50 per person based on 8 guests. Palm trees in London make this the most idyllic and stunningly peaceful oasis within the M25. Moored just half a mile from Hampton Court Palace (King Henry VIII’s home) with a direct direct train link into Central London. The area includes a choice of excellent restaurants and pubs. The Marina is opposite Bushy Park (second largest Royal park), home to red and fallow deer; perfect for a lazy Sunday stroll. This boat is a very beautiful and cleverly laid out classic French motor yacht with a really rich heritage. She has been recently renovated, remaining sympathetic to her former style and will sleep up to 6 guests from £35 per person (based on 6 guests). Stay on this boat for a special place to stay in London. Inspired to find a unique place to stay in the UK? 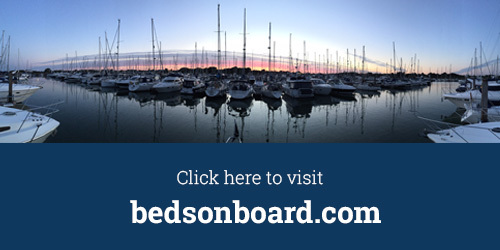 Prepare to be inspired on Bedsonboard.com as we bring you the most unique places to stay in the UK. The search for unusual accommodation often means that you have to swap from website to website. Now Beds on Board can save you time with a variety of Boats in lovely locations across the UK. Have you stayed on any of these boats? Share your pictures with #anotherwaytostay. Or have we missed any boats that you think should be in this list? Then let us know. Sign up today, the most unique places to stay in the UK await.